How to Make Matcha with Dr. Andrew Weil,. M.D. How to Prepare a Great Bowl of Matcha. A Bamboo Matcha Whisk (Chasen). A Bamboo Matcha Scoop (Chashaku). A Linen Tea Cloth (Chakin). FYI: If you try to use western utensils to prepare matcha, it most likely will not turn out well. It’s best to use traditional utensils outlined above as they will enrich your matcha experience and greatly increase your chances of making the perfect bowl on matcha. 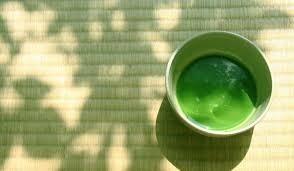 Our brewing suggestions for preparing both usucha (thin matcha) and koicha (thick matcha) are shown below. Please note, you can’t make koicha matcha from an usucha matcha, so please make sure you know which type of matcha you have before preparing it. In addition, there are other slightly different variations of preparing usucha and koicha that you may have learnt and enjoy using. If so, please feel free to use that method instead. Preheat the matcha bowl by filling it about 1/3 full with hot water. Then place the whisk facing down into the hot water to wet the tips of the prongs (not the whole whisk!). Once the bowl has thoroughly preheated, empty out the water and dry the bowl out preferably with a cloth such as a chakin. Set the whisk aside and then measure out 70ml/2.3oz for Usucha, or 40ml/1.3oz for Koicha of hot water into a measuring cup and leave it to cool. Use the bamboo scoop to measure the matcha powder, about 2 scoops for Usucha, or 3-4 scoops for Koicha, and place it into the bowl. Note, sifting the matcha prior to measuring out the matcha is highly advisable to remove any clumps of powder. Once the water that was measured out in STEP 1 drops to 70°C(158°F)-80°C(176°F) pour it into the matcha bowl. Take the whisk in one hand and hold the rim of the matcha bowl with your other hand. For Usucha, whisk the matcha briskly in a W motion using your wrist (not arm) until the matcha has a thick froth with many tiny bubbles on the surface. For Koicha, the idea is NOT to make a frothy consistency with a fast whisking action like usucha. Instead, a slower kneading action from left to right, up and down, and a gentle 360 degree rotating action as shown in the image (to the left) can be used to make a thick consistency. The resulting tea should be reasonably thick, smooth and without froth. We’ve added this video for your instruction in preparing matcha.